Hi there, love the site, love the plans. 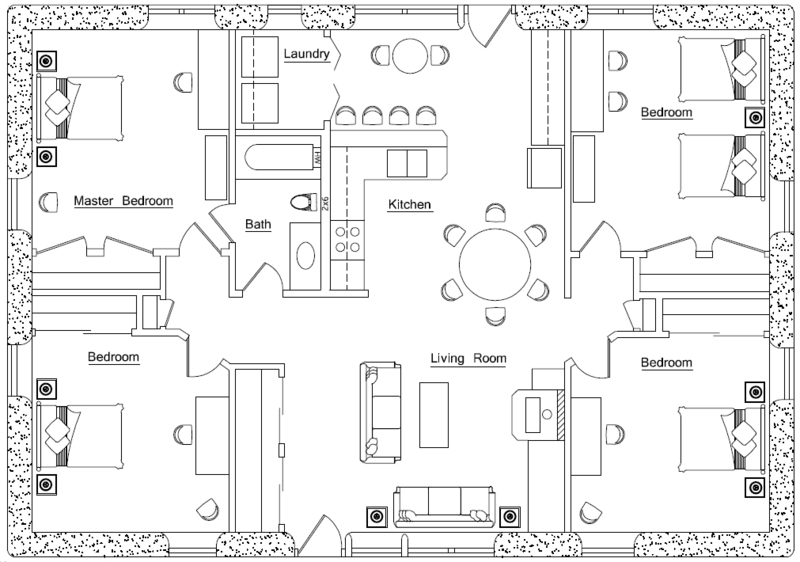 I was just wondering what software you use to help draw these plans? All plans are AutoCAD with SketchUp perspectives. Hi, just wondering where I could find the plans for this with directions. Are they available for purchase? 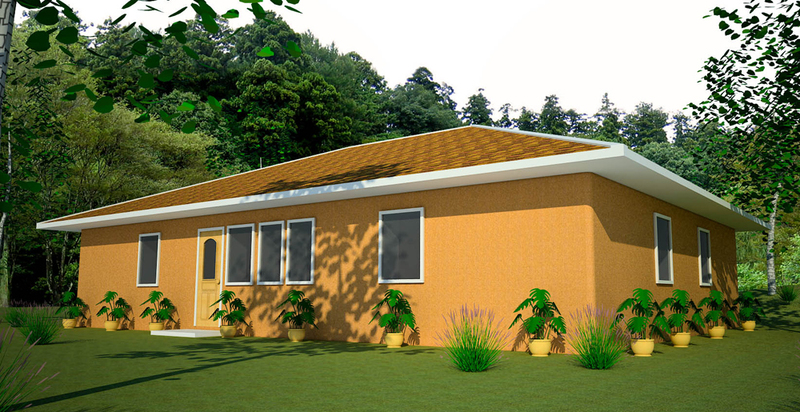 I had considered an ICF house but not only is this more affordable it looks safer for tornado weather. We love this plan. This is the first we hear of earth homes. Does it literally mean bags full of sand? We need more info. Most earthbags are filled with moist subsoil or other types of soil (road base, etc.) that turn very hard after tamping. There is one type that uses primarily sand. Other people fill the bags with insulating material such as scoria. Lots of options. Our Earthbag Building Blog and EarthbagBuilding.com have all the details. Summer Breeze states Ideal for hot climates, I live in Michigan, is there something I can do to make this plan work up here? I recently Homesteaded property in Beatrice Nebraska. I discovered that the property is located in a flood plain, and no basements allowed. I origionally wanted an EarthShip, but the cost s too high, and the area is not a good place to build one. I am now leaning towards a 900 sq foot 2 bedroom Earthbag home. In this climate and with the flood plain, is an Earhtbag home still an option? I grew up in Lincoln and went to school there. I am very interested in the Summer Breeze plans, I would need to build with a Footing/Stemwall & crawl space foundation, can this be done with the stock plans or will they need to be modified to build this way? I make small modifications like this for free. But it’s up to you to find out the frost depth in your area and anything else regarding codes. I love this design! Do I need to make any modifications if building in Terlingua Texas? Just curious – I thought straight walls more than 10 ft long needed buttresses? How do you get the stability with these walls? Also, in order to add insulation to the outside of the walls, do you just do a double-thick wall with scoria on the outside wall, or is there another preferable way to insulate? Which design is that? Almost every design can be improved by tweaking it to your local climate. Yes, you can build two-story. However, I suggest using lightweight building materials rather than earthbags for the 2nd story because moving heavy soil high in the air is very laborious. Sorry, I’m not doing custom plans at the moment. There are various ways to reinforce walls: rebar pinning (very common and easy to do), interior shear walls, post and beam, etc. So yes, you need to reinforce long straight walls, but that’s not difficult to do. The fastest, easiest way to insulate earthbag walls is with rigid foam board insulation, stucco mesh and stucco. This is the same way they insulate adobe houses.